Note: this feature is not available on all plans, and may cost extra. Create the purchase page and add it to your app menu. 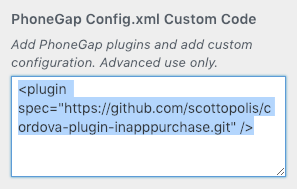 Add the in app purchase plugin to your site. Make sure you have the Cordova IAP plugin code in your custom config, then rebuild your app. The <in-app-purchase> component outputs a form that includes an email, username, and password. After purchase, a user is created through our in app purchase plugin. noLogin - (optional) set to "true" if login, registration, and validation with WordPress are not required. For example, if this purchase is just to remove ads in the app. No user will be created in WordPress. Save this page and add it to your menu. Next, make sure you have the in app purchase plugin installed and activated. First, login to your WordPress site and visit the AppPresser settings. Click the "Log" tab, then check "enable logging." This will allow you to see the API calls if there is a problem. If you setup test users as per our documentation, you can build the app with dev certs for iOS, and no key for Android. Download the app to your test device and try the purchase. For iOS, you will be prompted to login. Use your sandbox tester email and password. For Android, you can add yourself as a tester in the Google Play Console under Settings => Manage Testers. You should be able to test the purchase with your normal account, or you can log in as a tester. Test subscriptions do not match the normal schedule, you can look up the renewal times online.